SKU: N/A Categories: Joyetech, Kits, On Sale! 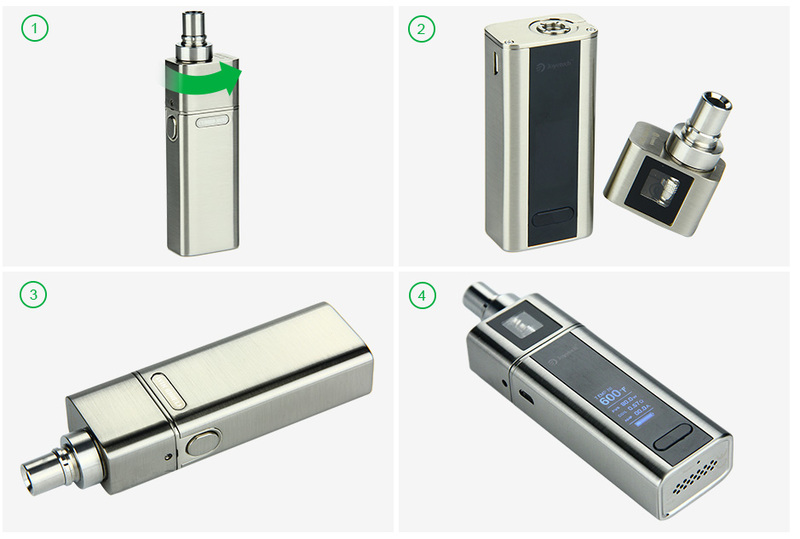 Joyetech Cuboid Mini kit combines Cuboid Mini MOD and the special oblong atomizer. 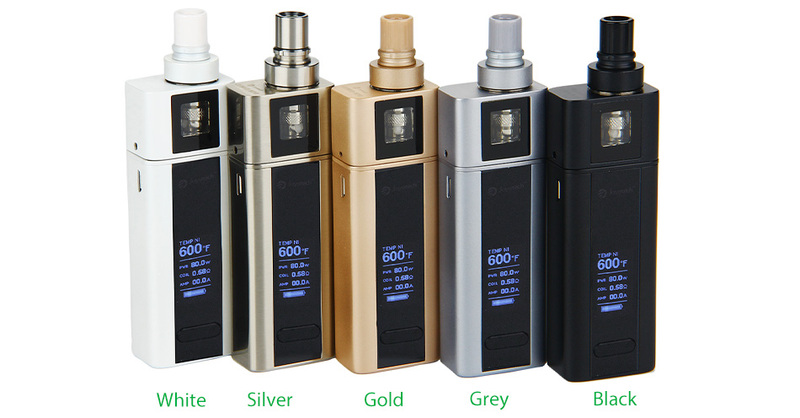 With Max output 80W, Cuboid mini has a 2400mAh Built-in battery. Variable vaping modes, Upgradable firmware, Notchcoil, 5ml liquid capacity all make Cuboid mini a great setup for you. Power On/Off: press fire button 5 times in quick succession to turn on/off the device. Vaping: adjust the wattage to what you want. Press fire button and inhale through the mouthpiece. Release the fire button and exhale. Stealth Function: when the device is on, press fire button and left regulatory button simultaneously to shift between Stealth On and Stealth Off Modes. Lock Function: when the device is on, press fire two regulatory buttons simultaneously to switch between Key Lock and Key Unlock function. Key Lock function can prevent accidental adjustment of device setting. Switch the Display: press two regulatory buttons simultaneously when device is off to rotate display of the device. 1. Press fire button 3 times to enter the menu, first row of 6 in the menu will flash to indicate you entering the menu. 2. Press regulatory button to switch among available modes. Press fire button or leave the display to flash 10 time to confirm the mode you choose and exit the menu. 3. Temp-SS316: Joyetech BF-SS316 atomizer head (0.5ohm/1.0ohm) is recommended under this mode. 4. 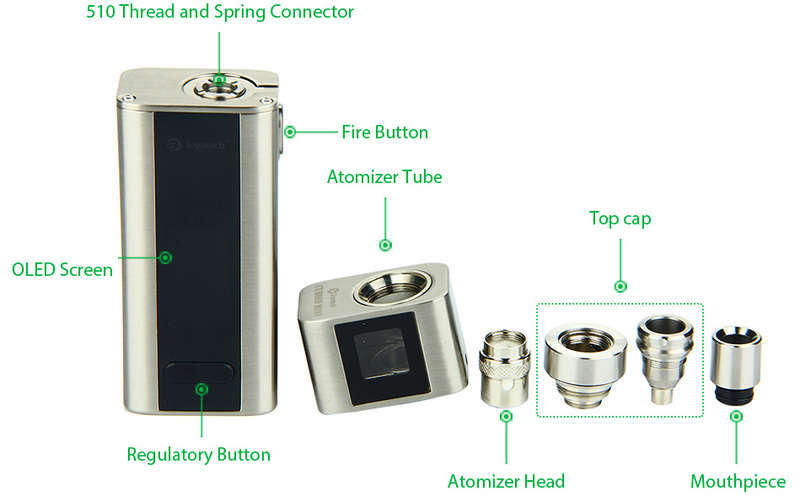 TCR (M1, M2, M3): temperature coefficient of resistance, is a new vaping mode that ever applied with Joyetech Product. When mode indication is still flashing, press the left button to activate sub-menu items, which will flash when activated. Press the right button when flashing to choose modes among M1, M2 and M3. Then press fire button to confirm. 1. Press right or left regulator to choose between TCR M1, M2, or M3. Then press fire button to confirm what you choose. 2. Press regulator to increase or decrease the parameter to your preference. 3. Long press the fire button or leave it about 10s to confirm the setting. 4. Under VT mode, coil temperature can be adjusted by press right or left regulatory button. A momentary press of the regulatory button will increase/ decrease the temperature by increments of 5℃ or 10℉. Connect USB port with a micro USB cable to charge or upgrade the device.